Despite Jim's wide stance, this isn't the Buckner that infamously let a ball roll between his legs in 1986; that was bigger brother Bill. Three members of the family played pro ball, including oldest brother Robert. Bill's the only one to spend time in the majors, but they all knew how to grow manly-man mustaches and would make excellent Movember fundraisers. 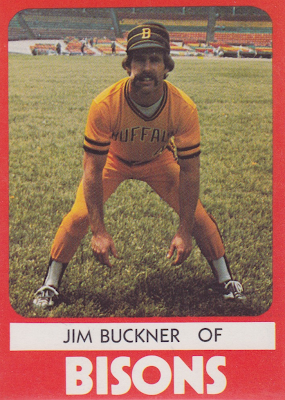 Jim's "leadoff stance" is reserved on cards for speedsters--see also 1975 Topps Herb Washington or 1982 Topps Rickey Henderson--and Buckner ran often, topping out at 50 stolen bases for Lodi in 1973 (career stats). He also caught my eye as an alumni of Yavapai College in Prescott, AZ, a school where my dad taught for almost 20 years. It's yielded a number of minor leaguers over the years, and one World Champion, Curt Schilling. 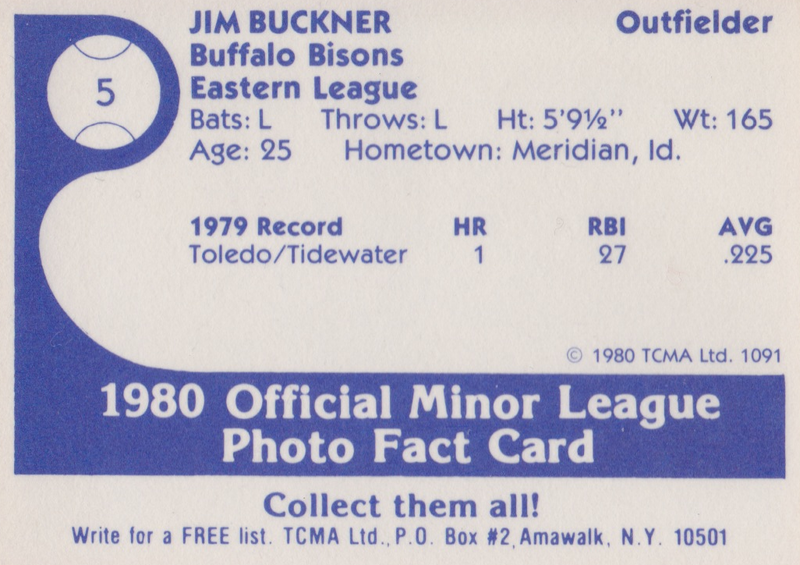 Buckner couldn't drive AAA pitching at Toledo or Tidewater (1 HR, .564 OPS) in 1979, but rebounded in AA Buffalo (16 HR, .780 OPS) a year later. Buffalo's original, 19th-century Bisons were an NL team for several seasons. All later incarnations played in the minors and this AA squad jumped to AAA in 1985 by switching affiliations with Wichita. TCMA printed just 16 cards for this team set, significantly fewer than others from 1980. Value: This #5 cost $2 at MinorLeagueSingles.com and teams sets would be $20 or so. Fakes / reprints: Haven't seen any in the marketplace. Dave Dravecky is its best-known major leaguer and probably not worth reprinting. Japanese Card Package from Ryan G!